Alabama State University (ASU) junior Ezra Gray is batting .500 so far in Magic City Classics. Gray felt the disappointment of a 42-41 loss in 2016 and the elation of a come-from-behind 21-16 victory in 2017. 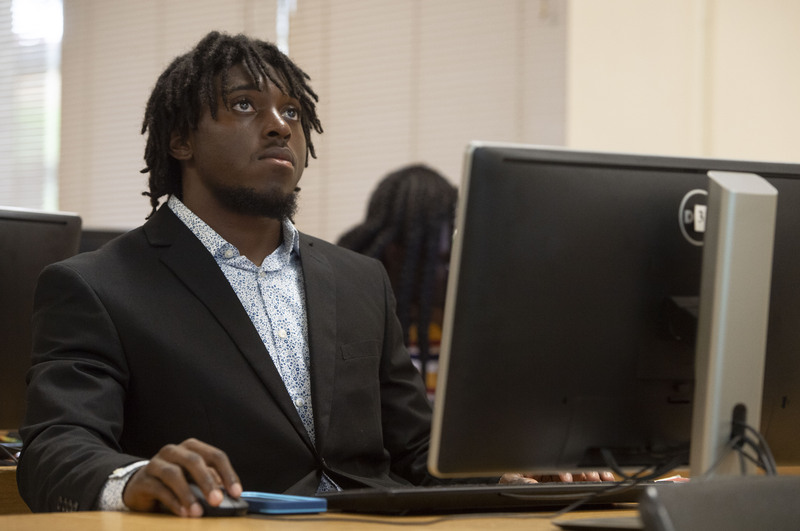 While he looks to continue the success he had against the Hornets’ biggest rival, Alabama Agricultural and Mechanical University (AAMU), on the gridiron, there is one place where he is batting a thousand—in the classroom. 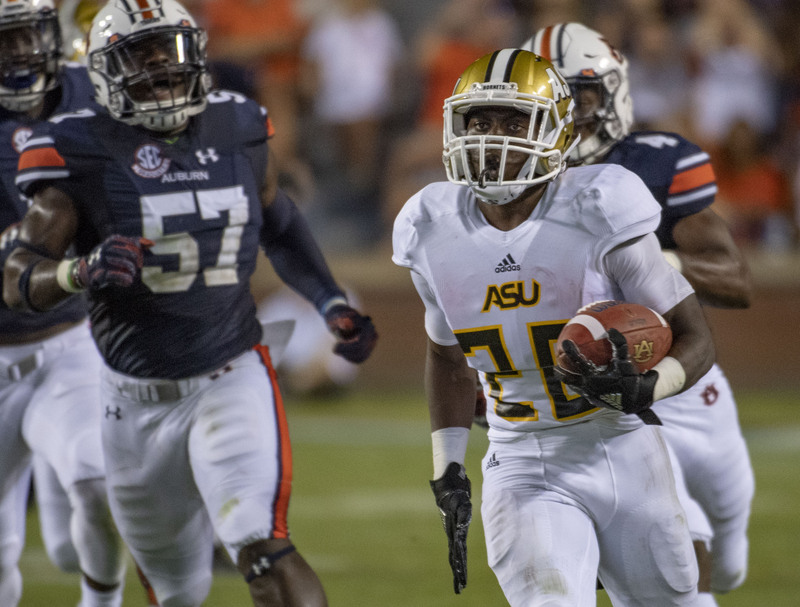 The Lynn Haven, Fla., native will be honored as ASU’s academic all-star at the 77th Magic City Classic (MCC) on Saturday, October 27, at Birmingham’s Legion Field. The AAMU honoree is graduate student defensive end Vernon Moland Jr.
Gray has a 4.0 grade-point average and is one of the team’s leading rushers. Through six games for the Hornets (2-4) Gray has 287 yards on 67 carries for two touchdowns. 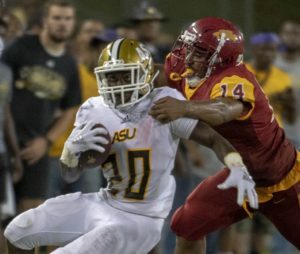 In his best effort to date, he had 78 yards on 20 carries with a touchdown in an upset over Alcorn State University. The 5-foot-9, 167-pound running back was an academic standout before arriving in Montgomery. 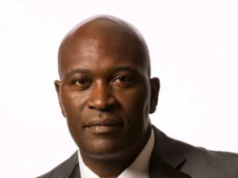 He was a member of the honors graduate program and the Fellowship of Christian Athletes (FCA) at Mosley High School in Lynn Haven, where he was a Hall of Fame selection at the high school. He also lettered in track and field and weightlifting. 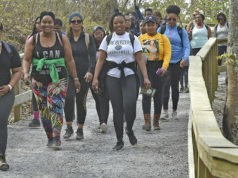 Gray recalled a video on social media of National Football League (NFL) player Richard Sherman, who played collegiately at Stanford University, talking about the demands of being a college athlete while also fulfilling academic requirements. Gray acknowledged that it could be tough but said it’s all in how you handle it. A typical day for Gray and his ASU teammates begins with breakfast. From there, they have meetings, workouts, classes, and academic responsibilities. Gray, a computer information systems major, said his choice of favorite class can vary from day to day, but one stays close to the top. 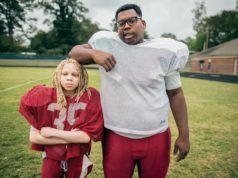 Like many college football players, Gray said his “number-one goal” is to make it as a player in the NFL, but he keeps that goal in perspective. Gray has three brothers: Enrique, Ethan, and Kendrick; his older brother Ethan plays in the Canadian Football League for the Hamilton Tiger-Cats. His parents weren’t college athletes, but they were role models. “My mom went to Central Piedmont Community College [in North Carolina] but she wasn’t a college athlete. She claims she was an athlete, but she wasn’t,” he added with a smile. Gray’s faith and family keep him going, as evidenced by some of his social media postings. For instance, in a Dec. 20, 2016, post he wrote: “2016 has been a year full of blessings! Hard work and tithing go a long way … WRITE DOWN YOUR RESOLUTIONS! That post included a picture of Gray’s 2016 fall term grades—all A’s. His mother, Bobbie Gray, commented: “Stay the Course!!! Always Remember Ephesians 3:20.